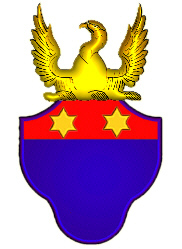 Coat of Arms: Blue on a red stripe at the top two gold stars. Motto Translated: Following my destiny. FALCON: Is derived from the Latin "falx", meaning sickle, a reference to the Falcon's wing shape in flight. Egyptians associated the Falcon with the 'Eye of Horus'. The god Horus was believed to appear in the form of Pharaoh's Falcon or as a Falcon-headed god. The mythology states he could see everything at once because one eye was the sun and the other was the moon. It is written that Falcons were permitted to ride on Pharaoh's nape as his protector and divine spirit. Falcons were used in a royal sport known as falconry. Is the art of training Falcons (or hawks) to pursue and attack wild fowl or game; falconry started in ancient China and Persia and soon became prevalent with the royals of ancient Egypt; the Falcon was associated with the Egyptian sun god 'RA' and later the Christians adopted it as an emblem of the saviour. A venerable symbol of majesty and power, heraldic writers add that the Falcon denotes someone eager, or hot in the pursuit of an object much desired; if seated on its 'rest' or perch it may signify a bearer who is ready and serviceable for high affairs." "Falcon or Hawk. In Heraldry is al ways represented close, if not mentioned to the contrary, and usually borne with bells on its legs, when it is termed a Falcon belled. If represented with hood, virols, or rings, and leashes, then it is said to be hooded, jessed, and leashed, and the colours must be named." Spelling variations include: St. John, St. Jean, Singen and others. First found in Oxfordshire where they were seated from very early times and were granted lands by Duke William of Normandy, their liege Lord, for their distinguished assistance at the Battle of Hastings in 1066 A.D. Some of the first settlers of this name or some of its variants were: Alpheus Spencer St. John who settled in Canada in 1835; John St. John who settled in Virginia in 1654; Thomas St. John who settled in Philadelphia in 1820. I am familiar with this website and one of the people associated with it. If this is whom I think it might be, it's nice to see you here once again. 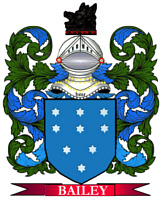 That particular coat of arms isn't the EXACT replica but pretty close to it. As for it probably not being the shield of the family of Matthias I wouldn't rush to that conclusion. One question that no historian or genealogist has been able to answer yet is, how did an engraving of that coat of arms wind up on a slate tablet for the tomb of Capt. Joseph St. John in 1756(250 years ago)? The reasonable explanation is that this family somehow had a tie in with the Bletso line and what that tie in is? It seems entirely to coincidental to me.There is a photograph of it listed in the St.John Genealogy, it's a broken tab but if you're familiar with the shield you can see the motto "Data Fata Secutus". Am looking for information on the line of Thomas St. John husband of Mary Hayworten (Howerton, relict of J. Day; relict of Thomas St. John) wife of John Billingsley. 1. The administrator of the St. John surname site paid for a man in England by the name of Anthony St. John to have his DNA tested, so that it might help the administrator who decends from the Mathias St. John and Mary Tinker; trying to find out and to indicate whether "The Ancient and Aristocratic St. John Family" included the said Mathias St. John and Mary Tinker of England. Conclusion: They were not a match in the 12/12 strand test, so Mathieas St. John and Mary Tinker decendants are not part of "The Ancient and Aristocratic St. John Family". 2. The administrator indicated that when I had my son's DNA tested that we were the first in the United States to test positive to our English Cousin, Anthony St. John of "The Ancient and Aristocratic St. John Family", and the administrator stated so... Since then we now have 3 DNA, my son's included that meet the 12/12 exact match to "The Ancient and Aristocratic St. John Family". 3. Our English cousins are helping with indentification of OUR Thomas and Mary St. John and where our Thomas St. John fits into the line of Bledsoe, since that is the line that Anthony St. John decends and thus the 12/12 EXACT MATCH for three St. Johns are based on. You will either decend from a Bledsoe or a Lydiard Tregoze. But, not any of Mathias St. John and Mary Tinker. In all of this, I hope that I have not said anything that would confuse or render a no hope of connection to any St. John.